So … Lee has been busy painting on some of our growing collection of vintage handbags. 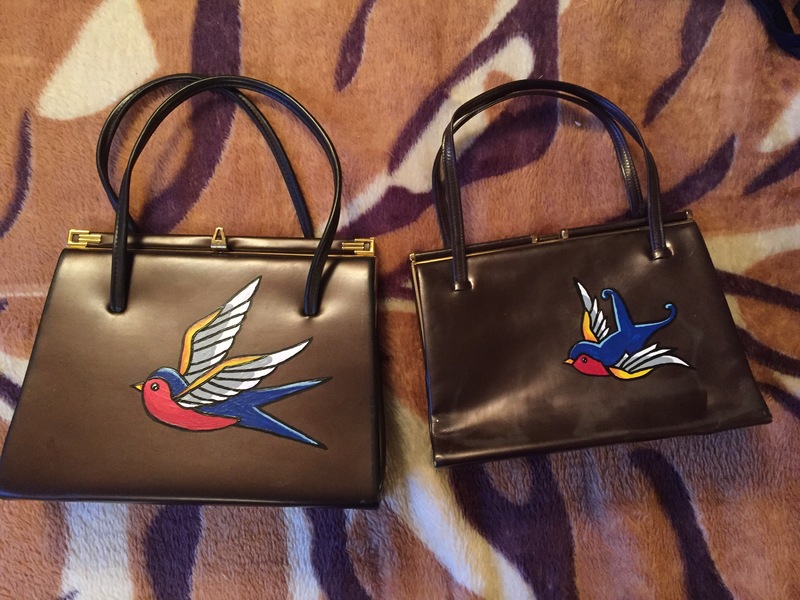 These two gorgeous brown vintage bags now have beautiful tattoo style swallows painted on them. The large brown one (£25) has a lovely sateen lining and the smaller brown (£20) has a gorgeous leather lining. The interior of both bags is in absolutely pristine condition. Given that the bags originate from decades ago they are in pretty amazing condition. There is some fading on the smaller one but it’s still just a wonderful bag. The inner label on it states ‘Debenham and Freebody’ and the Freebody was dropped in the 1970s so it’s definitely from before that date. The larger bag is labelled ‘G London England’ and the only online reference online I can find dates this bag to about 1940.